Manufacturer of a wide range of products which include soldering iron tips. 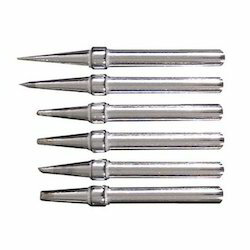 We are Leading Manufacturer of Soldering Iron Tips. Being a technology driven company, we are engaged in the offering Soldering Iron Tips to the clients.This offered machine is high in demands among our industrial clients owing to its optimum quality and durability. Looking for Soldering Iron Tips ?